"In my dreams I feel hands pulling at me from every direction, tearing at the flesh that falls from my bones, and everywhere I look it's my mother clawing for me." I haven't actually started this one yet, but I will be very soon, especially after that teaser! What's a teaser from the book your currently reading? Leave me links to your posts! oh that is a good tease! Oh I really enjoyed this series but it's a very love/hate series from the reviews I've seen! Curious to see what you think! My stepmum just finished reading this series, and I was so jealous because all I heard was "OMG I CAN'T BELIEVE.... AWWW I keep forgetting you haven't read this yet, IT'S SO GOOD" haha! Sounds amazing!!! Totally creepy -- and I love it! What a cool teaser... gotta read this book. Oh, are you enjoying this? 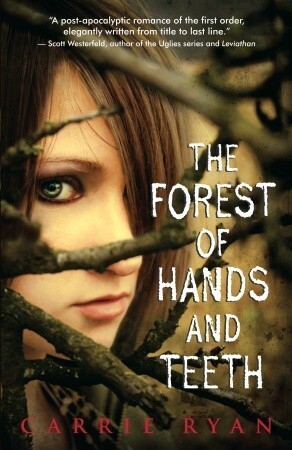 I read Forest of Hands and Teeth a couple of years ago and it really messed with me. On one hand, I love it. The writing? It's amazing. The story is compelling, and it's dark and creepy... but I really didn't like Mary. BUT, I thought she was believable... compelling, and I ached and felt for her. Truly. But the book left me so depreeeeeessssseedd. And then I decided to follow it up with A Million Little Pieces. BAD CHOICE. I haven't started reading it yet, but sounds like I will have to read it in broad daylight!!! I will have to leave something light for after then. Not sure I have many light and fluffy reads waiting to be read! Ohh, that's so scary! Omg, I can't wait to see what you think for this one! I've seen quite a lot of good reviews, and it really looks very interesting! Ahh, erm no, not a book for me i'm afraid. It sounds creepy! Fab teaser though! Lol. Oh hi Amy, I've heard soooo many good things about The Forest of Hands and Teeth - and that teaser does look particularly inviting. I've attended quite a few conferences where this book has been featured quite a lot. Really interesting. I haven't read this one yet, I usually can't do zombies, but I've seen so many good things that I might just give it a go and deal with whatever nightmares come lol. I hope you enjoy it!